Makes: 1/2 Cup of Gongura Pickle. Separate the sorrel leaves and thoroughly wash them. Pat them dry and keep aside. Soak tamarind in few tablespoons of hot water and keep aside. Roast all the powder ingredients except asafoetida in a pan until aromatic or until they change color. Cool the roasted ingredients to room temperature and grind them along with asafoetida and salt into fine powder. Heat oil in a pan on medium flame, add the sorrel leaves. Cook covered for around 8 minutes. Uncover and cook for around 5 more minutes till sorrel leaves thoroughly wilt and change color. Add tamarind mixture to the pan and cook again for another 5 minutes. Stir in ground spice powder and salt and remove from heat. Remove the gongura pickle onto a jar and it stays fresh for around an year. Notes: Make sure to cook the sorrel leaves well. Suggestions: Adjust spice with whole red chiles. Variations: Check other variations of sorrel leaves pickles here. Other Names: Gongura Pickle, Sorrel Leaves Pickle. Oil is tempered with spices and onion is turned translucent. Sorrel leaves / gongura aaku is chopped up and briefly fried before slowly cooking in stew. 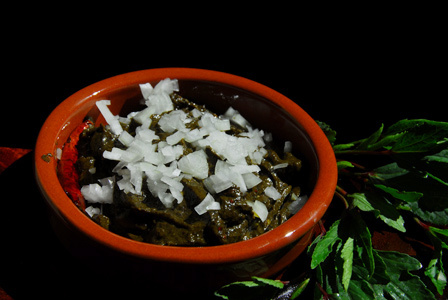 Sorrel leaves stew is served with steamed rice and plain toor dal or with steamed rice and dollop of ghee. Makes: around 2 Cups of Sorrel Leaves Stew. Separate sorrel leaves and wash them thoroughly. Chop the sorrel leaves and keep aside. Grind green chiles into coarse paste. Heat oil in a pot, add chana dal and fry for couple of seconds. Now add all talimpu ingredients in order. When urad dal changes color, add onion and chana dal. When onion turns translucent, add sorrel leaves, green chile paste, tamarind, red chili powder, turmeric powder and salt. Fry for a minute or two, pour around a cup and half of water. Bring to a bubble and boil till it reduces to almost of the original quantity. 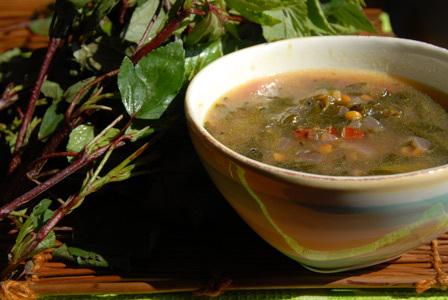 Remove from heat and serve sorrel leaves stew with steamed rice and a tbsp of cooked toor dal. Notes: Make sure to boil the stew on medium – low flame. Suggestions: If the stew is too sour, stir in a small piece of jaggery. Variations: You can also soak the chana dal in water for couple of hours before adding to the stew. Other Names: Sorrel Leaves Stew, Gongura Pulusu. 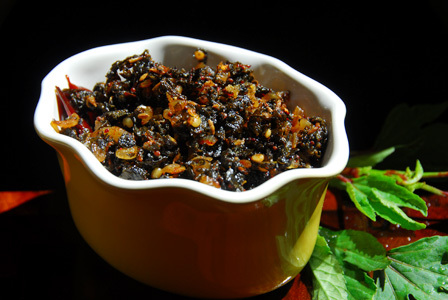 This is a fresh chutney made from sorrel leaves / gongura. Sorrel leaves are fried along with green chiles in oil till cooked. Then they are ground into fine paste before tempering with spices. 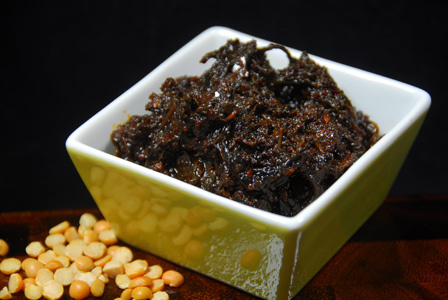 Serve spicy sorrel leaves chutney garnished with finely chopped onion. Pluck the sorrel leaves from the stalks. Wash thoroughly and roughly chop the sorrel leaves. Heat oil in a pan, add chopped sorrel leaves and green chiles. Fry the sorrel leaves till they wilt and season with salt. Cook covered if the sorrel leaves are not quite soft which requires lot of cooking. Remove the leaves from heat and cool to room temperature. Grind the cooked sorrel leaves mixture into smooth paste using a blender. 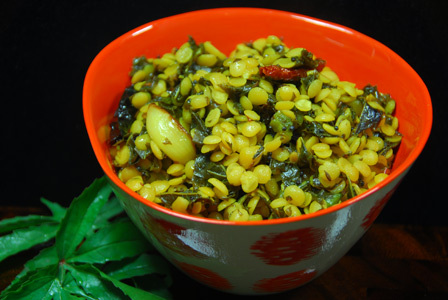 When urad dal changes color, add the ground sorrel leaves mixture and fry for a minute. Cool the chutney to room temperature and store tight in a refrigerator. Suggestions: Adjust the spice according to the sourness of the sorrel leaves with green chiles. Variations: You can also grind some fresh garlic with the chutney. Other Names: Spicy Sorrel Leaves Chutney, Gongura Pachadi. Sorrel leaves are washed and pat dried before chopping them. Oil is tempered with spices and onion is fried till its golden brown. Then the chopped sorrel leaves are fried in it along with red chili powder till done. Noone gongura is generally served with steamed rice and dollop of ghee. Makes: around 2 Servings of Sorrel Leaves Stir Fry. Pluck the sorrel leaves from its stems. Wash the sorrel leaves thoroughly and pat them dry. Spread on a kitchen towel to let them dry for couple of minutes. Once dried, sorrel leaves are finely chopped. Heat oil in a pan medium heat, add all talimpu ingriends in order. When urad dal changes color, add chopped onion. Fry till onion turns light golden color, stir in chopped sorrel leaves. Fry the sorrel leaves for around 5 minutes or until they start to crisp up. Stir in red chili powder, turmeric powder and salt. This stir fry stays for couple of days fresh without refrigeration. Serve sorrel leaves stir fry with steamed rice and dollop of ghee. Notes: Make sure the sorrel leaves are cooked properly. Suggestions: If sorrel leaves are not cooked well, put the pan back on heat and cook covered till done. Variations: Check out the Sorrel Leaves tag for more recipes with sorrel leaves / gongura aaku. Other Names: Sorrel Leaves Stir Fry, Noone Gongura, Nune Gongura.